class="page-template page-template-page-sections page-template-page-sections-php page page-id-738 samba_theme wpb-js-composer js-comp-ver-4.1 vc_responsive"
Registered in England No: OC375427. Bring to life and transform your cottage floor with a durable vinyl finish. Simple to keep clean, anti-slip, durable and long lasting. 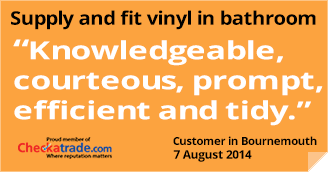 When deciding what flooring to have fitted in your kitchen, Vinyl is the first that comes to mind. Hard-wearing, stylish and available in a huge range of colours, effects and finishes – you can be sure to find the perfect match for your home. The biggest selling points for vinyl/lino flooring are how water-proof and how easy it is to clean. The kitchen is naturally an area prone to spillages, so having something wipe-clean is a huge plus. Most customers we speak to in our Bournemouth showroom are aware of the traditional vinyl sheet flooring and some of the vinyl tiles, but most are unaware that there is a third, very attractive option. Here at QCF Bournemouth, we can also supply and fit vinyl plank flooring. This has the great plank look of wood or laminate flooring, but all of the benefits of other vinyl flooring options. The majority of our vinyl products are slip resistant and feel warm to the touch. 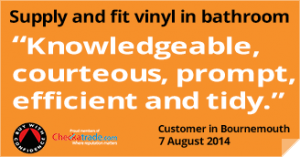 We offer a home selection service where we bring vinyl samples to you in the comfort of your own home. Please contact us to make an appointment at a time to suit you. A member of our highly experienced team of fitters, will come to your premises and measure your rooms for you. A no-obligation estimate can normally be given the same day.